To enable kids from all walks of life to experience the power of making music. We are passionate about improving instrument design. The Nuvo design process starts by taking a fresh look at the form, mechanisms and materials commonly found in traditional instruments, many of which have their design roots in the 1800s. Our instruments respectfully preserve the musicality of traditional instruments while adding modern innovations that make learning more effective, especially for children. Our instruments are ergonomically suitable for all ages. They are lightweight and easy to handle. Our instruments are designed to make note production easy for beginners but the quality of the tone is not compromised. Our instruments can withstand extreme use making them particularly suited to the classroom. It is safe to keep them assembled and out on a desk stand or wall hanger, which encourages more frequent practice. Our instruments can be customised. We provide a choice of colors, styles and special editions. Our instruments are easy to carry around, assemble and clean. The materials used are 100% washable in warm soapy water! They are easily maintained. Our instruments are affordable for school programs at all levels worldwide. British innovation. Expertly made in China. Learning to play a musical instrument can be profoundly lifechanging. Besides the joy of making music, it gives increased confidence and a heightened sense of purpose. Numerous studies have revealed that students who participate in music programs at an early age perform better in other subjects and thrive socially. It is equally joyful and rewarding to take up a musical instrument later in life. Our most senior Nuvo student is 86 years young! However, learning to play a musical instrument isn’t easy! It requires concentration, frequent practice, an enthusiastic teacher, a suitable instrument and some degree of passion. Many traditionally designed instruments present hurdles that add to the challenges and inhibit the learning process unnecessarily. We produce instruments that minimise those hurdles and make learning easier, faster and more accessible. 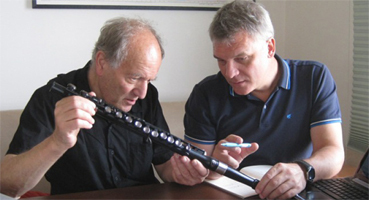 Nuvo was founded in 2008 after Graham visited Max in Hong Kong to discuss the redesign of the Lyons C Clarinet. We set up Nuvo after discovering a shared passion for helping people of all ages and walks of life to experience the joy of playing a musical instrument. Since then we have developed and produced 6 new instrument concepts and currently ship to over 30 countries around the world. Graham has over 40 years experience in performing, composing and teaching clarinet, saxophone, flute and bassoon while Max has 20 years of designing and manufacturing consumer products. Graham is based in the UK and can occasionally be seen riding roller blades while playing his jSax! Max has his base in Hong Kong but frequently skips time zones on his travels around the world promoting and supporting the work of Nuvo. We have an open and collaborative working environment and love to hear from anyone who has something to say about our products or music education in general. Bo has been working for Nuvo since 2008 and manages all production and product development operations at our workshop in China. Lucky is a dedicated team member and is the first point of call for all our International Distributors around the world. Ricky is a graduate of Product Design from the Universtity of Bournemouth, UK and is in charge of product development projects for Nuvo. Brittany is an experienced music educator and has a masters in Music Education from Kent State University, OH. She is running Nuvo’s US office in Beverly, MA. Cassandra is our Music Education Specialist based in the US. She has a masters in Music Education from Frost School of Music, Miami and can be seen around the US enthusing music educators about the benefits of Nuvo instruments in the classroom. Bruce is an experienced music educator and exceptional saxophone player while also doubling on Flute and Clarinet. He is based in Hong Kong and is working on a number of new initiatives to help bring more Nuvo to classrooms around the world. See Learning Materials.